Home » Posts tagged "List of Equipment and Machinery for Knit Composite Dyeing and Garments Factory"
Generally knit composite receive yarn from spinning. The process starts with yarn dyeing and finishes with fully knitted garments ready to send to the customer. Different stages and process involved in a knit composite factory. 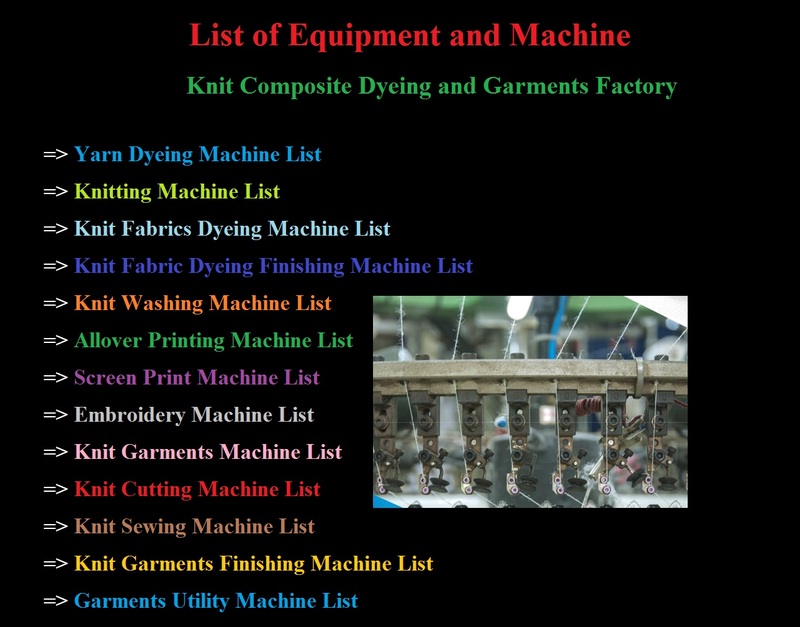 In this article, I made a List of Machinery for Knit Composite Dyeing and Garments Factory which will be required for doing the process of a composite factory. Machinery and Equipment may have different brands sourcing from the different country, its varies from factory to factory but working principle is more or less same. As like woven Garments, there cutting, sewing and finishing section in knit garments. Please see below section wise machine list.